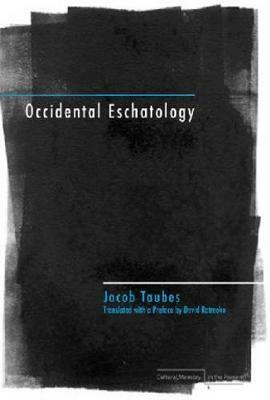 Occidental Eschatology, originally Jacob Taubes's doctoral thesis and the one book he published in his lifetime, seeks to renegotiate the historical synthesis and spiritual legacy of the West through the study of apocalypticism. Covering the origins of apocalypticism from Hebrew prophecy through antiquity and early Christianity to its medieval revival in Joachim of Fiore, Taubes reveals its later secularized forms in Kant, Hegel, Marx, and Kierkegaard. His aim is to show the lasting influence of revolutionary, messianic teleology on Western philosophy, history, and politics. Combining painstaking scholarship with an unmatched scope of reference, Taubes takes a comprehensive approach to the twin focuses of political theology and philosophy of history. He argues that acceptance of the idea that time will one day come to an end has profound implications for political thought. If natural time is experienced as an eternal cycle of events, "history" is the realm of time in which human actions can make decisions to alter the progression of events. This philosophy asks that individuals take responsibility for their own actions and resist authority that claims to act on their behalf. Whereas universal history is written by the victors, the messianic or apocalyptic event enters history and gives a voice to the oppressed. One of the great Jewish intellectuals of the twentieth century, Jacob Taubes (1923-1987) was a rabbi, philosopher of religion, and scholar of Judaism. A charismatic speaker and great polemicist, he is often said to have had his greatest impact as a teacher, but his published oeuvre is increasingly becoming of interest. Stanford published a translation of his Political Theology of Paul in 2004.